by Marcia Hill Gossard ’99, ’04 Ph.D. | Photo by Henry Moore Jr. The idea first came to Dr. Faux several years ago when she saw a fiberglass horse with the thorax anatomy painted on it. The horse was being used for large animal rescue training, but Dr. Faux knew it could also help veterinary students learn. “I thought it would be helpful for our students to visualize the placement of important internal anatomy,” she says. By seeing in 3-D where the skeleton, lungs, heart, stomach, and intestines are, students have a better understanding about where the organs are placed in relationship to each other. And knowing anatomical locations is critical for accurate diagnostic procedures, says Faux. 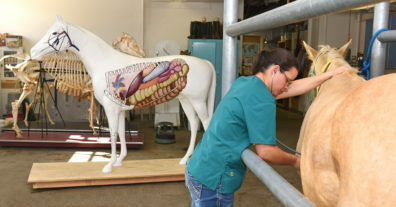 Besides being used in the classroom, the horse will be available for students to use in the WSU Clinical Simulation Center, for public outreach by the equine and pony clubs, and for anatomical review during fourth year clinical rotations. Alyssa Marre (’20 DVM) listens to a horse’s heartbeat. The painted horse helps her visualize which chambers of the heart she is listening to so that if something doesn’t sound right she can more easily pinpoint the problem, make an accurate diagnosis, and come up with an effective treatment plan. 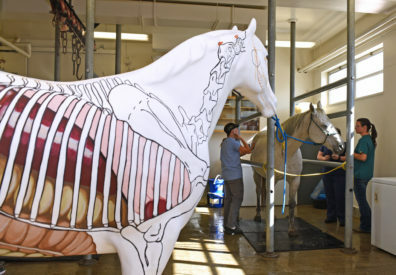 In their anatomy class, third year veterinary students visualize where the organs are located on a painted fiberglass horse. Robin Soifer (left) and Alyssa Marre (right) are shown here.